Mid-Ohio is an old school circuit that plays host to some big events, including AMA and IndyCar. It's also home to the Mid-Ohio School. The 2.4 mile course is a lot of fun (I speak from experience in this case), with several tough corners and sequences and a couple crazy elevation changes. The Club Circuit, made use of for most track days and some competitive events as well, differs from the Pro Circuit in the addition of the Chicane. The racing line at Mid-Ohio begins with a couple sections that require more speed than one might expect. Turn 1 is obviously the biggest radius on the course (other than the Kink), and it takes a good bit of throttle to drive all the way to the outside on the exit. Coming to the Chicane, many pilots, particularly riders, carry much less speed than desired. Don't brake too much, and that extra velocity will encourage proper line selection at the Keyhole, where it's best to clip the first apex and let your momentum carry you out to mid-track as you get your ride turned toward the back straight. The infamous "China Beach" sandtrap awaits those who get brave with their braking point at the end of the back straight. Exiting Turn 6, Al shows each vehicle type getting close to the outside, but many drivers stay near mid-track. Turn 7, aka "Madness," is off-camber, over the crest of a hill, and a lot of fun. After the apex, it's very popular to use the throttle and reduced traction to drift out to mid-track or even farther before driving left to set up for 8. 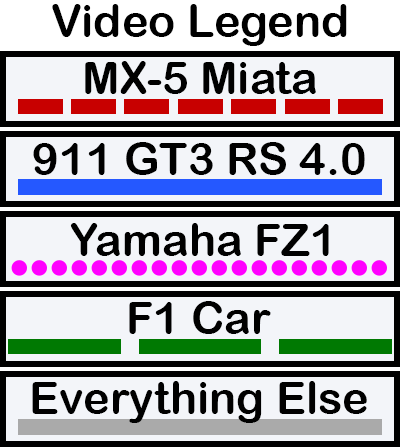 The calculated line, however, shows that no vehicle should be going past mid-track, and that only the motorcycle turns in for 8 without being at the far left hand side of the track. Turns 9-10 can be taken very fast, and setting up this way helps maximize speed through that section. Coming out of Turn 9, the apex of 10 is initially concealed. This may be why drivers tend to stay to the left and miss that apex, subsequently failing to reach the outside of the track before turning in for 11. As demonstrated by the Mustang in the videos below, and confirmed by the optimization, hitting the apex at 10 lets you carry more speed through 9 as well as get to the outside prior to Turn 11, thus maximizing speed through Thunder Valley. Turn 13 is kind of scary as you come barreling down on it. No advice for you there. The Carousel is also quite tricky, and can present difficulty in trying to find a consistent line. Stay close to the inside, but definitely take a double apex. There is a significant bump in track right at the second apex, but if you're on two wheels you can squeeze by it on the right side with your knee on the kerb. Turn 14 is close to flat out except for liter bikes, with a lift near the apex for many vehicles, then it's back out onto the front straight! This is a really nice lap, but there are a couple things to point out. The double apex at the Keyhole is a bit deep, but definitely the right idea. The one spot this driver loses a lot of time is in the Esses. Coming out of Turn 7, only the Miata or another low powered vehicle should come out anywhere near mid-track. Everyone else should be pretty close to the inside, setting up for as much speed through 9 and 10. Lastly, this driver goes really deep before turning in at the Carousel. I tried this line, and it's slow. Better to stay closer to the inside and take a tight double apex. I would still say that this driver is losing ground through the Esses due to drifting too far toward mid-track while exiting Turn 7. At times the car is pointing left toward the outside of the track before turning in to 8, and that costs time. The guy with dreds is an instructor at Mid Ohio. Notice the double apex at the Keyhole, as well as the Carousel. I think he may be able to carry more speed and accelerate harder once exiting 8 by following Al's line, including hitting the apex at 9 before riding all the way to the outside before turning in at 10. Pretty close to Al's line, especially through Turn 7. Out to mid-track, then not quite all the way to the outside before turning in for 8. This rider doesn't get all the way to the outside before turning in at 10, which seems like a fairly common approach.